Everybody likes the idea of a cake competition – until of course you are the decorator and you have about as much talent as the size of one of those icing tip thingies. But all is fun and games when you are doing something good to help others. Last week Kroger hosted the sixth Annual “Bringing Hope to the Table” Cake-off with local media personalities (including yours truly!) The invited media personalities were paired with a Kroger pastry chef, supplies and one hour to compete against other outlets for the “Ace of Cakes” title and a $1,000 donation in their name to the North Texas Food Bank and Tarrant Area Food Bank. While I love watching my Food Network and all my experience eating cakes and cupcakes, I didn’t have much to work off of except the provided theme: “hope,” “family,” and “happiness.” And being matched up against some of the best reporters in DFW like Melissa Newton, Arnold Wayne Jones, CW33s EyeopenerTeam, Dallas Observer's drinks and eats diva and others wasn’t so easy either, but a little bit of love, courage and the opportunity to raise awareness for a very worthwhile campaign were enough to get me through the competition for my fourth time. 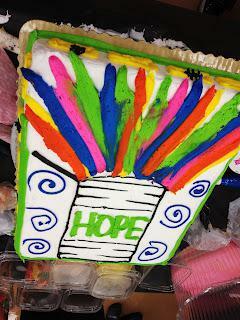 Kroger's Cake Off Kicks Off the Bringing Hope to the Table Campaign. You can help now until June 9 to fight hunger. Interested to see who won? Take a look at some of these cakes and let me know if you agree in the judges’ decision! Want to be a part of the fun? Then buy up those yellow tags! The “Bringing Hope to the Table” gives shoppers the opportunity to help raise money for the North Texas Food Bank and Tarrant Area Food Bank and their programs that support local food-insecure families, seniors and children. From now until June 9, 2012 customers can purchase a variety of tagged products and a percentage of the sale will benefit the food banks. This year, the “Bringing Hope to the Table” campaign is expected to raise more than $125,000 in the Dallas-Fort Worth area. So do your part and buy your groceries at Kroger while you make a difference in DFW. Are you facing the challenge of motherhood? Then join us on mamachallenge.com...because there's no bigger challenge than being a mama.